Since the first time I traveled in which all my reservations and bookings were done online, I became hooked; both to traveling and booking everything with the help of internet. Every year from then on, I make it a point to travel to at least one city or province or major tourist attraction in the country. Of course that doesn’t include a few weekend getaways to neighboring islands or towns. I just love how a lot of things can be done online and that includes booking for a flight, hotel reservation and tour packages. It isn't even impossible to tell if a hotel has good reputation or not due to lots of reviews available online. And being one of the group’s trip organizers (have experienced organizing a trip for 17 people); some would expect that I am expert when it comes to this and must have tried various booking sites, apps and the likes. But that is not the case with me. 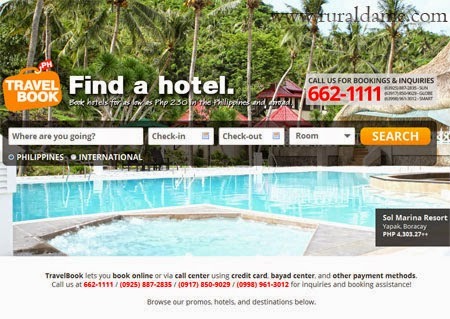 It was only recently when I started using sites such as booking.com and TravelBook.ph to book my hotel. I check these sites from time to time to read reviews and compare rates but I haven’t booked through them as I prefer booking with the hotel directly. While browsing a local forum last week, I saw an ad for TravelBook.ph boasting their “up to 50% discount” on participating hotels. And since I haven’t finalized my hotels for my Bohol-Cebu trip in November, I decided to check out what the site can offer. Unfortunately, the resorts/hotels in Panglao, Bohol included in my shortlist are not part of the promo and those with discount are not suitable for me (too far from the beach, exceeded my budget); I searched for Cebu hotels instead. Gladly, the hotel that is on top of my list offers 45% discount so I booked it the next day. No booking or web admin fee. The trip is more than a couple of months from now so I cannot comment on the check in and checkout process or how guests who booked through the site are being treated. Anyway, my first transaction with TravelBook.ph has been pleasant so there’s a big possibility that I’ll be booking with them for my future travels. I have experienced booking with travelbook.ph last July. Yep, the booking experience was pleasant. The inconvenience happened when we were checking in at the hotel. The receptionist had no record of our booking in their system so we were forced to wait for almost an hour as she contacted her manager probably asking about what to do with us. Now, for a paying guest, that is really humiliating particularly in a small hotel lobby where other guests take notice that the receptionists are verifying the authenticity of your CLAIMED booking. It was a very stressful wait since we had no idea what would happen next. Luckily, after a long insulting wait, they sorted it out. That was one hour of wasted vacation time. As a former hotel employee, I am guessing that travelbook.ph is not yet accurately wired to in-house booking systems of hotels unlike established third party booking sites like Expedia and Booking.com. That was the first time I encountered a problem upon check in after I booked through a website other than the hotel's own booking page. Imagine the horror if the hotel located somewhere you are not familiar with was not able to trace your booking at all. I suggest that you double check your reservation with the hotel first prior to your check-in date. Thanks for the heads up. I emailed travelbook.ph just a while ago to verify my reservation. Just waiting for their reply. I just wish that if i can give rating in negative also instead minimum 1 start, You only use these freaks if you want to spoil your stay at any hotel. I've booked My hotel for camiguin back in March, I've paid using my CC for 3 days stay, Got confirmation that booking is confirmed, But after 1 day got another email saying hotel did overbooking. I simply said why the hell i've to care about that one because I don't know hotel I know you guys, I paid to you in simple term I hired you to book my hotel and you did already then why the hell i've to suffer for hotel's overbooking? Don't you have agreement with your hotel partners that not to do overbooking if booking made online? And these freaks answers are crazy, They don't believe at all in customer service. And they answer email after 1 days imagine I booked my hotel only 10 days before my stay. I would strongly recommend that you use these freaks only if you've plenty of time and patience for tourist please do no use these guys at all, You might learn new way of customer service. Uses of Baking Soda… for me!